Pity the poor northeastern United States! After a long, brutal winter, a dry spring has turned into a wet summer. This makes it hard on construction companies hoping to catch up on projects, and some are being forced to work in less than ideal weather circumstances as a result. It is possible to get effective work done safely at construction sites despite bad weather, with the right kind of advance planning. What should be factored into these bad weather plans? Safety First, Safety AlwaysWhile it is possible to work in some types of rainy weather like drizzle and showers, heavy downpours, electrical storms, and hail are definite no-gos. For marginal weather that allows for some outdoor work, make sure workers have the proper garb and equipment. Treaded, non-skid footwear, gloves, hoods and other outerwear permits work in some conditions. Further protect worksite access by placing non-skid materials on work area surfaces, and tie down or remove materials that could become air borne or otherwise dangerous to workers in bad weather. Cover or close off work areas where pooling rainwater could become a problem. Make sure a hand signal or other communications protocol is in place to compensate for reduced hearing and verbal communications that can come with poor weather. 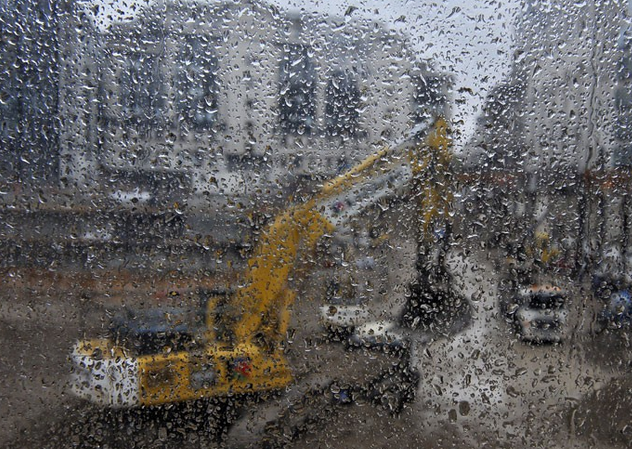 ContractsConstruction firms can't control weather, and clients know this. However, a prudent construction firm will make sure that language is built into contracts that allows for construction weather delays. This won't entitle firms to payment during work stoppages due to weather, but it can protect firms from having to pay penalties or submit to wage cuts as a result. SoftwareNot only can Raken's software be used for daily reporting, it can also be used to quickly issue weather safety reports in real time not only to managers, but site workers via their cellphones. Raken's software also allows for automatic weather capture, which means that users get data from all major weather stations, emergency weather notifications, and weather histories in graph form. Raken is also a construction weather tracking software that allows managers to track weather by project locations on dashboards, meaning that managers with multiple project worksites are able to get an overview of how weather will affect various locations, and plan work schedules accordingly. And of course, Raken's reporting software means that managers can get caught up on paperwork as they wait for weather conditions to improve without having to leave a worksite. Being prepared won't guarantee good weather, but it can guarantee safer worksites that can remain functional in all but the worst weather, saving time and money.